Some activities, like a quiet reading, is perfect for one barefoot critter. Cooking pancakes is great for a pair. But a race is better with five, and nine is the best number to play in the fort. And what about when crossing the dark spooky forest? Better if the whole dozen of them is there, so there is nothing to be scared of! 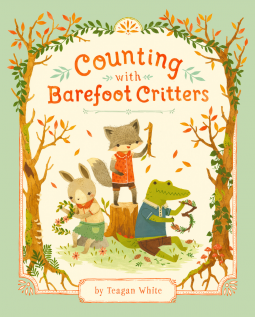 Counting with barefoot critters is a counting book in beautiful rhymed prose and full of cute illustrations. At the beginning for the book there is a amazing map to follow the critters adventures. It is a great option for a read aloud time. I'm interested in read a previous book in this series, Adventures with barefoot critters, which plays with the letters and seasons.